Air cryosauna Criohome ® quickly becomes popular among clients of the beauty and health improvement industry: fitness, SPA, talasso and wellness centers. The visitors of such centers are mostly successful people, and they know well, that the vital and life success sometimes directly depends on physical and emotional condition of the person. They have opportunity to choose the most suitable and effective procedures among a lot of services and consider innovations in the industry of health improvement with big interest. Among such innovations is the air cryotherapy which became popular not only due to fashion, but also and mainly due to the remarkable health improving influence to human organism. 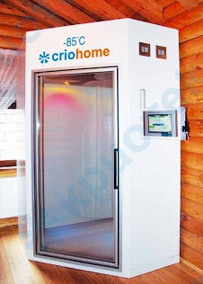 Air cryosauna Criohome ® is quite capable to meet demand of the cryotherapy supporters which becomes more and more. The health improving institutions offering such service to its visitors, get appreciable competitive advantage at the market of health improvement services. Physical and emotional well-being is the main task of Wellness movement. Air cryosauna Criohome ® in the wellness center will serve to both common health improvement purposes and as antistressful facility improving psychoemotional condition. The cryosauna reduces or even absolutely removes depression, and also decrease uneasiness level. Sensation of ease, freshness, good mood and increased workability - it is the result of cryo procedures, which, by the way, do not borrow a lot of time and do not strain clients at all in comparison with other similar procedures. SPA centers, which provide their clients with different services, can fill up their collection of saunas and banya with air cryosauna Criohome ®. During the session there is activization of metabolic processes, improvement of microcirculation, soft skin drainage, spasm removal, relaxation of muscles, including mimic ones, skin tone regeneration. All this allows to apply Criohome ® successfully with the purpose of rejuvenescence and common health improvement of the human organism, in the anti-cellulite programs and weight reduction programs.